Egg donation is the practice of one woman—the ‘donor’—providing her eggs to another—the ‘recipient’—for use in assisted reproduction treatment, which usually takes the form of IVF. It is particularly applicable to couples having problems with egg production or quality or who have certain genetic disorders they wish to avoid passing on. Often, couples will turn to egg donation when attempts through standard IVF protocols have not borne fruit. It represents a viable alternative that can make getting pregnant a real possibility again, in situations where it could not otherwise be. Through Medical Travel, you get to ‘customise’ your donor by choosing her physical traits and blood group, which criteria our clinic will then use in the selection process. Read on to learn more. *Prices listed in euros (€) are fixed; those in pounds sterling (£) may vary according to exchange rate at time of procedure. In the case of the basic package, if at least one embryo suitable for transfer is not yielded, a new donor will be provided at no extra charge. In the case of the comfort package, a new donor will be provided if fewer than six eggs are harvested or if fewer than two embryos suitable for transfer are yielded. If the first and second fresh cycles are not successful, a third will be offered either for free (Comfort Package) or at a 30% discount (Basic Package). This will come in the form of a shared cycle, in which case we guarantee four harvested eggs and one healthy embryo for transfer. For the guarantee to apply, sperm must be of sufficient quality (in a state of ‘normozoospermia’), and the recipient must suffer from no autoimmune diseases, natural killer (NK) cells, or uterine fibroids. Also, any frozen embryos remaining from one cycle must be used before the next fresh cycle may commence. Next attempt with frozen unused embryos (FET - Frozen embryo transfer) costs 700 EUR. We require medical report from your doctor to see why you cannot carry and deliver child. You need to find your own surrogate mother and she needs to undergo pre-treatment tests required for egg donation treatment. We will use your own eggs and your partner sperm or donated sperm (your partner needs to agree with using sperm donor). In accordance with Czech law, assisted fertility treatment can only be administered if the woman is below 49 years of age and has a verified male partner. Gynem is an exclusive and unique new fertility clinic, designed specifically for IVF treatment, which meets all of the European health standards. The IVF Centre provides a whole range of IVF procedures, such as ICSI, PICSI, IMSI, MACS, Embryoscope®, Embryoglue®, Laser Assisted Hatching, PGS, and Vitrification. 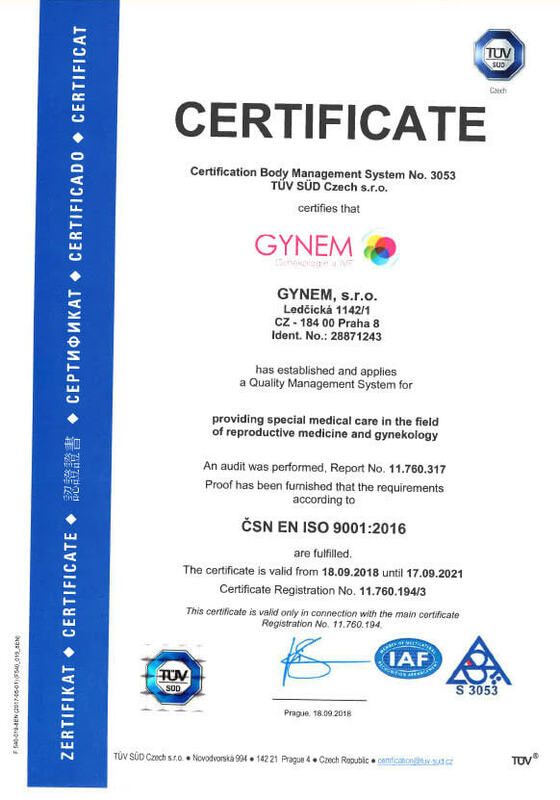 Our clinic, GYNEM has established and applies a Quality Management System for providing special medical care in the field of reproductive medicine and gynaecology. To see ISO 9001:2016 and TUV CERTIFICATE please click on TUV logo. The first step is to fill in our fertility questionnaire and egg donation form. You can undergo required pre-treatment tests for you and your partner back home or at the GYNEM Fertility clinic. During the initial consultation with our experienced doctor, an individual stimulation protocol will be determined. Sperm can also be collected and frozen so that it is not necessary for the man to return to Prague again. The price of the initial consultation is 150 EUR, which will be returned to you once you decide to go ahead with our Egg donation programme at GYNEM Fertility clinic. If for personal or work reasons you cannot travel to Prague for an initial consultation, this is an alternative option. The first step is to fill in our fertility questionnaire and egg donation form, undergo required pre-treatment tests back home and send us the results. After the clinical evaluation we will provide you with Skype consultation with our fertility doctor. Our IVF coordinator will find a suitable donor for you, we will send you medicaments via post and issue a stimulation protocol for you. Online consultation is free of charge. The stimulation of your ovaries starts on the 2nd day of your period. After 10 days from the beginning of stimulation, you must visit your personal doctor to make an ultrasound scan to check that the uterus lining height is appropriate, or it is also possible to arrive in Prague and visit GYNEM fertility clinic for ultrasound scan. Around the 15th day of stimulation the egg retrieval of your donor will take place. On the same day, a sperm sample will be collected for fertilization (unless provided in the first visit or if donor sperm will be used). The cultivations of embryos lasts 3-5 days and we inform you every day about how the embryos are developing. Around the 20th day from the start of the stimulation the embryo is transferred. We currently transfer 1-2 embryos. The amount of transferred embryos will be discussed and decided with the patient and embryologist. Unused and healthy embryos can be frozen and used at a later time if the first attempt is not successful. 14 days after the embryo transfer you will take a pregnancy test. If the pregnancy test is positive, you will continue taking prescribed medications until the 10th week of pregnancy. If the pregnancy test is negative immediately discontinue taking prescribed medicaments. Your total stay in Prague is approximately 2 days if you wish to use frozen sperm from your first visit and if you undergo an ultrasound scan on the 10th day of your stimulation back home and send us the results via email. You will arrive one day before the embryo transfer. Your total stay in Prague is approximately 7 days if you undergo an ultrasound scan on the 10th day of your stimulation back home and send us results via email. You will arrive one day before the egg retrieval (we need your partner's sperm). Your total stay in Prague is approximately 10 days if you undergo the ultrasound scan on the 10th day of your stimulation here at the clinic. You will arrive on the day of your ultrasound scan. The male partner’s stay in Prague can be reduced to only one day. Our IVF fertility doctors follow the European standard of care and operational standards. The head physician of GYNEM Fertility Clinic is Dr. Milan Mrazek, PhD, who is the former president of the Czech Association for assisted reproduction and will provide the highest quality of medical care. He has more than 20 years of experience in assisted reproduction and 35 years in obstetrics and gynaecology. If STD test results register positive/reactive, an additional examination will be required at a fee of €100. Donations in the Czech Republic are anonymous. We have no waiting time for finding the right donor. Our egg donors are mostly composed of students of higher education. At our centre, all egg and sperm donors have to undergo blood tests for sexually transmitted diseases and genetic defects in order to provide safety for you and your offspring. You are able to choose the colour of the eyes, hair, body weight, height, education and blood type. The services of Medical Travel and Gynem was very professional but also personal and warm. We’ve been so happy with our coordinator, Hana Kawakami, who has been so supportive through this. We’ve been through three transfers and I’m now 5 weeks pregnant after my third. I have a good feeling, specially since this embryo was quality 1 from day one. Lets hope! Gynem was recommended by a friend. Of course, we searched the net to get some information about Gynem. Most of them were positive. So we decided to go ahead. We called Gynem and Zita responded to our phone call. She explained us step by step what we had to do. We understood everything what she explained, very well. We had no experience with Gynem directly but due to my business relation with some Czech companies, I already knew that the Czech Republic is very developed country on technical issues and Czech people are very serious and trustable people. Our first visit to Gynem went very smooth. We were picked up from the airport by a car sent by Gynem. Zita welcomed us and arranged our visit to the doctors. Meanwhile, our tests and scan were done and we had the result in just an hour. Our impression was very positive. A modern, well-equipped clinic with professional doctors and staff. Once again, we decided to go ahead. During our treatment period in our home country, Zita was always very helpful. She responded to all our telephone calls and emails on time. She sent us all the necessary medication whenever we needed them within a couple of days. Our second visit to Gynem went as well as our first visit. Smoothly and professional. The embryo transfer was made with success without any complications. As a result, we are now pregnant with 5 weeks and hope that everything will continue to go well. We had a very pleasant and positive experience with Gynem and we sincerely recommend Gynem to all couples. We would like to thank again Gynem and specially Zita for everything. After several negative IVF trials in Norway to complete our family (we already have a 3-year-old son through IVF), we decided to go for egg donation. As ED is illegal in Norway, we started investigating our options abroad. After researching different clinics in several European countries, we decided to go with the Gynem Fertility Clinic. And we have absolutely no regrets for choosing Gynem, as we are currently expecting our second son! The clinic has been fantastic all the way through the process. Martina, our coordinator, has been very helpful in adapting the treatment to our time schedule, providing necessary information all along the process and just being genuinely supportive and caring. We can highly recommend Gynem. I wouldn’t hesitate to recommend Gynem for anyone thinking of pursuing fertility treatment abroad. I wish I done it far sooner instead of having so many failed attempts in the UK. Finally, after being abruptly told by my consultant at home that I should give up and I was now too old we decided to look into embryo donation abroad. All the clinics in Prague seemed to have good reviews so I chose Gynem based on price and then randomly a friend mentioned the clinic to me, so I took that as a good sign! Initially, I thought the logistics of travelling abroad would be too much, but the staff were so helpful. In fact, I travelled alone for my first treatment with Power of Attorney consent from my husband which meant he was able to stay home and look after our daughter from our only successful ICSI treatment at home. During my first treatment at Gynem I dealt with Martina initially and then Janina. Both women went above and beyond what I expected in terms of customer service. Martina even travelled to my hotel to leave medication for me on arrival as my flight from the UK had been cancelled and I was a day late arriving in Prague. Janina arranged airport transfers for me and then a taxi the next day to take me to and from the clinic as I chose to stay at a hotel near the old town rather than near the clinic. Even though going through fertility treatment can be stressful I enjoyed my time in Prague, it is a lovely city. Although my first embryo donation was unsuccessful I had no hesitation in returning to Gynem for another attempt. The cost of two attempts at Gynem was still cheaper that one attempt in the UK. I liked that there are no hidden costs, you know exactly what you will be paying. Following a Skype review with the doctor he suggested I get immunology testing at another clinic in Prague before embarking on another cycle to rule out any issues that might prevent the cycle working. This was never suggested to me in the UK. Janina liaised with the immunology clinic to set up the appointment for me. The testing came back fine, and I think this reassured me for my second attempt knowing that there was no underlying reason why it shouldn’t work. I was also pleased to know that Gynem weren’t just going to take more money from us without checking for underlying problems. Janina kept in touch with me throughout the whole process and I knew that if I had any questions I could drop her an email and she would get back to me. She was able to courier over medication for me so that I didn’t have any hassle with prescriptions over here. My second embryo donation was successful, and I am now 29 weeks pregnant with a little boy! After 9 years of trying in the UK I never thought we’d be lucky enough to add to our family. I have already recommended Gynem to another couple and told them to ask for Janina. I’ve been up since 5am, local time here. I have been convinced I’m not pregnant and was already preparing myself mentally for our next (5th) round in IVF but I don’t have to (I hope)...I AM PREGNANT! I am so overjoyed! Words cannot describe how I feel right now. I just can’t believe it! Thank you! Thank you Martina for all of your support and assistance in helping us get to here. I stressed that I wanted this to happen quickly and you made sure it did. The whole experience and process have been a top class service for us. All at Gynem we’re fantastic and you especially, have given a brilliant service. I really can’t thank you enough. In these last 2 weeks, I kept on having flashbacks to when one of the ladies came out of the procedure room to talk to me and she said, ‘it’ll be a good Christmas present’. I smiled and got excited and since then kept on thinking, ‘please, please’. It is the best Christmas present! Thank you again to you and all at Gynem! I couldn’t recommend you highly enough. Me and my wife did IVF treatment for the first time and had no prior experience with IVF or pregnancy, but our coordinator (Janina), doctors, embryologist, nurses, receptionist - they all provided us with great useful information at each step and made us comfortable throughout the entire process. We did an absolutely free pre-consulting Skype session with their doctor who explained to us the entire process and answered all our doubts and questions. This made our decision to go with Gynem very easy and already put us at comfort. At our first visit to Prague, we were provided with a free taxi pickup from the airport. And when we arrived at the clinic for the first time, we were greeted by our coordinator Janina with a smile. It's great pleasure to work with Janina, she answered all our questions and was our single point for contact for any questions whatsoever. She took care of handling our appointments with the doctor, coordinating with the embryologist, donor, labs and everything. Janina is always willing to help with a smile and was always just a phone call or email away. She was always very responsive and has a great attention to details. She is very organised and on top of the entire procedure and showed genuine interest in our case. We can't thank her enough and highly recommend here and the Gynem clinic to anyone looking for IVF procedure. We couldn't have asked for more. Gynem was quick in finding us a donor matching our criteria and there was no wait whatsoever. We were always kept informed in a timely manner on the procedure, pricing and progress at each step. Everything worked like a clockwork. There were no long waits, delays, extra costs or any surprises. The procedure went exactly as explained to us and the clinic facilities are to the mart with special attention to details. We had a great experience with Gynem. I and my wife were taken care of and always felt at comfort with Gynem team. We can't thank Gynem team enough for making this experience not so stressful for us. Thanks a lot to the entire team, you guys do a great job every day with such a grace. I highly recommend Gynem and Janina to anyone without a second thought. We really enjoyed everything. Even though is such an emotional and stressful time, you and the staff made things easier of us. We appreciated all the questions that were answered, even the tips how to get around, what tram and subway to get. That was awesome. I hope so too I can give you good news soon. It’s very hard to keep together. Sometimes I get discouraged and think didn’t work. Other times I am very hopeful. Anyway. Thanks for everything. From the very start I found yourself very helpful & informative even though I asked a million of the same questions all the time you still responded. And the fact that you were on holiday & still responded made us feel important and that we weren’t just another number! Helping with accommodation choices & transport from the airport is really good. The daily update on the stage of the embryos was really good. We felt like a family & homely feel to the clinic. My partner has only maybe recommended to have the discussions in a private room rather than in the reception area. My only recommendation would be that maybe the remaining embryos be frozen for 12 months instead of the sperm to be included in the overall price. Other than the above I would definitely recommended this clinic ! And I think the patient coordinator is the most important & I can say you went above & beyond to do everything possible for our journey. Thank you once again n from both of us ! We are so so happy to share with you our happiest news ever! - what we are waiting for so long - that I am pregnant! Yes! And this is confirmed! First we did our house test on Friday morning, which has already gave a positive result! Than every morning till today, which showed the sign of the HCG hormon! Tuesday morning I went to see my gynecologist who also confirmed my miracle! First the ultrasound showed the gestational sac and the thick endometrial. The embryo took a perfect place to implant! It was so wonderful to see on the screen! Later I got my blood test result which gave 2297mlU/ml! Woow! My doctor said it is nice high, so I asked maybe am I having twins! He said no.... but maybe? Oh Jana, even if one or two little one, we are so glad and grateful to visited you and your clinic! I can not say thank you enough to give me this opportunity to know that I am able to have a chance to be pregnant! Thank You! Thank You! Thank You! Of course I will be careful and I continue to take my medicines. Please give our best regards to all of your staff who was part of our treatment and tell them how happy we are that we visited your clinic! We will definitely keep you updated! We hope you are doing fine and we wish you more and more successful stories! Have a wonderful week! Woman, 48, who spent £80,000 on IVF and had 18 miscarriages reveals her joy at finally giving birth to her 'dream baby' after using a donor embryo. Woman who spent £80k on IVF but suffered 18 miscarriages while trying to get pregnant over two DECADES finally becomes a mum aged 48. Woman who had 18 miscarriages before finally having a baby at 48 says she's been mistaken for his grandmother. Woman becomes a mother at last after 18 miscarriages. Woman who suffered 18 misscariages over two decades finally becomes a mother. A deposit of 1 600 EUR (Basic Package) or 2 000 EUR (Comfort Package) must be paid beforehand via bank transfer / credit card / cash once you have confirmed the treatment (covers the costs for the donor). The remaining sum must be paid prior to the embryo transfer (we accept cash, credit cards, or a direct bank transfer into our account). A deposit is non-refundable.